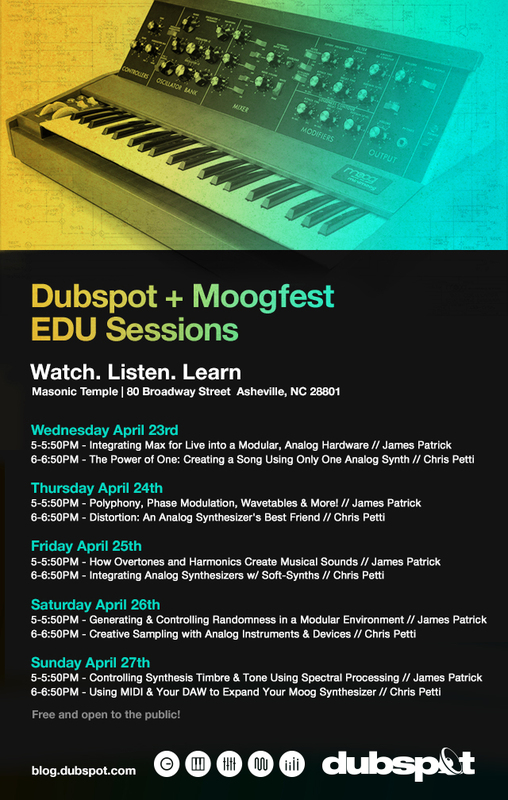 Join Dubspot at Moogfest in Asheville, North Carolina from April 23rd – April 27th for 5 days of in-depth analog synthesizer EDU Session workshops. Dubspot is headed to Asheville, NC! Dubspot looks forward to partnering with Moogfest to present a series of hands-on, outside the box analog synthesizer EDU Sessions. Participants will learn to create new sounds, integrate analog hardware with their DAW and use effects to further shape their analog sounds. These EDU Session workshops will take place on each of Moogfest’s 5 days, with two workshops per day at the Asheville Masonic Temple. Check out the full schedule below along with more information about each workshop. See you soon Asheville! In this workshop, instructor James Patrick demonstrates how he uses Max for live in conjunction with CV analog control. This workshop will demonstrate the power of analog technology using one Moog synth to make all the sounds for a song. 5-5:50PM – Moog and Ableton Live’s Sampler collide to offer Polyphony, Phase Modulation, Wavetables and more! Dubspot instructor James Patrick will teach participants how to use their monophonic Moog synthesizer in conjunction with Ableton Live 9 to inject harmonic and timbral complexity into the classic subtractive world. Explore new sonic territories with these simple yet effective techniques. In this workshop, Chris Petti explains how to create sounds using advanced processing techniques with distortion. He will demonstrate techniques using analog distortion, digital distortion and parallel processing. James Patrick explains what harmonics are and why humans find them pleasing in this EDU Session. James will demonstrate how our perceptions change via a variety of analog synthesis techniques and uncover many of the mysteries of what we perceive as “musical” sound. In this workshop, Chris Petti will demonstrate how analog synthesizers can be used simultaneously with virtual plugins and soft synths such as Native Instruments Massive, Razor, Absynth and FM8. The modular and CV world lends itself immediately to a greater understanding of not only how sound works, but also how to interact with each stage of the signal flow along the way. Breathing life into each of these stages with subtle bits of modulation can oftentimes be the difference between a calculation and a truly visceral sonic mass. James demonstrates how we can employ a variety of tools (Reaktor, Max for Live, etc) to keep our analog sounds alive and compelling. With CV modulation, there are so many variables and random elements introduced with regard to the way sound is created. In this EDU Session, James Patrick will show participants how to purposefully create randomness and manipulate it in the modular environment. In this workshop, Chris Petti will show participants techniques for working creatively with analog instruments along with virtual samplers in a DAW. James Patrick will explain Spectral Delays, Spectral Distortion and Spectral Mixing in this EDU Session. Learn and hear how these techniques can be used to enhance, brighten, widen and shift your tones into fresh directions. This workshop shows participants how to use the MIDI capabilities of your DAW along with a Moog synthesizer to expand its sonic capabilities.